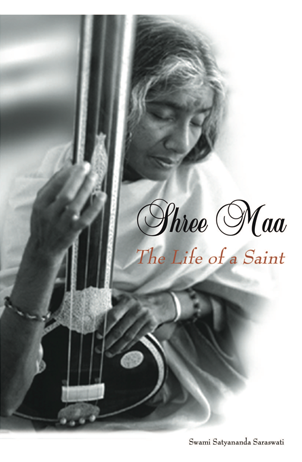 The biography of Shree Maa describes the extraordinary experiences of an enlightened being. Knowing her divinity from childhood, Shree Maa left home at an early age to reside in the seclusion of the Himalayas and devote her life to spiritual practices. Having realized her ultimate unity with God, she has dedicated her life to sharing wisdom and inspiration. The story of Shree Maa’s journey is a classic example of realizing the human potential, no matter what field of endeavor one may choose. Swami Satyananda’s clear, simple style makes the life of an extraordinary person like Shree Maa accessible to the western reader. The fact that this Swami spent his childhood and early adult years in the US allows him to translate the exotic and unusual experiences of an Indian saint into an easy to comprehend, enjoyable reading experience. This book is easily digestible and leaves you with a good feeling, like a delicious vegetarian meal cooked with a lot of love. I found the author’s description of Shree Maa’s childhood particularly fascinating. Many of us may have wondered what people like Gandhi, Yogananda, Ramana Maharashi and others were like when they were children. Here Swami Satyananda gives us a rare glimpse into the formative years of a saint. The advantage of writing a biography about a living saint is that there are so many first hand witnesses to their amazing lives. Throughout this book, both from westerners and easterners who know Shree Maa well, we receive a very personal and touching view of this great soul. The freshness of these stories give this book an unusual exuberance and vitality. The fact that the Swami has now lived with Shree Maa for twenty years allows him to write, not from the dry perspective of a historian, but from one with intimate direct knowledge of this extraordinary person. Swami’s first hand descriptions of meeting and traveling with Shree Maa were particularly illuminating. The Sadhus stories at the back of the book were reminiscent of Paul Reps classic collection of Zen Buddhist teaching stories Zen Flesh, Zen Bones. These pithy stories are fun and illuminating. I would recommend this book for all readers who are interested in gaining insight into the ancient wisdom of Hinduism and who want to understand how the enlightened state of mind manifests in a human body. Shree Maa, the life of a Saint, reveals a life devoted exclusively to divinity in all its forms. Since childhood, her purity and focused determination brought her to the highest realization of the omnipresence of God. Without concern for personal comfort or gain, her life exemplifies true spiritual behavior and illustrates the ideals of human perfection. In this enchanting biography, Shree Maa, the life of a Saint, Swami Satyananda tells the true story of Shree Maa of Kamakhya, one of the most respected yoginis of North India. Shree Maa grew up in one of the wealthiest and most prestigious families of Assam, before rejecting a life of privilege for a life of spiritual practice in the Assamese jungles. Swami Satyananda’s account of her transformation into a saint is incredibly inspiring, as are the many beautiful passages describing how the yogis and yoginis of the Himalayas actually survive in one of the most remote locations in the world. He includes eye witness accounts by devotees who have met her in India and abroad, as well as a delightful collection of Shree Maa’s own favorite stories of the saints and ascetics of India. In the mid-1980s, Shree Maa’s guru abruptly sent her to the United States. The story of Shree Maa’s reaction to America, makes for enlightening, moving and amusing reading. Sometimes when I read about India’s saints and yogis they seem so far away, as if they belong to an inspiring fantasy world of the past, which doesn’t really connect with my own day-to-day existence in Western culture. This book is a much appreciated reminder that extraordinary men and women are still being born and bred in the Himalayas, and that they’re not as far away as we imagine. “Shree Maa is a pure example of Truth in the Kali Age.” Ramnath Aghori Baba. “Shree Maa is one of India’s most beloved and respected Saints. At last her extraordinary story is being told to the English speaking world!” Sushil Choudhury, Inspector of Schools, Government of West Bengal. “Shree Maa is the real thing. What a story! Everyone on the spiritual path should have this book.” Swami Vishnudeva Vairagi, Mahanta, Kalpataru Math, Orrisa. This is a very special story about one of India’s most beloved saints, written by an American who fully adopted a Hindu path and became Shree Maa’s close partner as a spiritual teacher and leader of worship. Written with great respect, Swami Satyananda tells the many stories that have grown up around this Indian incarnation of the Mother Goddess and her complete devotion to God, which she lives out in both deeply joyful worship and in the exquisite care of those around her. Woven into the warmly good humored and inspiring stories are quiet lessons in Hindu philosophy and religion, reflecting Shree Maa’s graceful blending of the various Hindu traditions into Oneness. Recollections by American devotees and delightful Sadhu teaching stories complete the volume. A joy of a book! -A.M. The book tells us about the life of Shree Maa through the eyes of Swami Satyananda as well as many devotees. Additionally, it has beautiful stories. It is a profound book that really made me think about how to live a life with God, in God and for God alone. Jai Maa! This book introduces us to one of the greatest living Saints in the world today! It is just amazing in how beautiful and simple it is. I have got copies of it for my spiritual friends and we are all unanimous in recommending it. Shree Maa’s life story is unbelievable each page taught me something so profound and uplifting that I am having a hard time saying anything except Thank You to Shree Maa and to Swami Satyananda for this great treaure house! It is so wonderful to be able to read and learn more about Shree Maa! She is simply divine as is her story as is this book! A very well written account of an Indian saint which arrived at deepest spritual insights and her American friend, who seems to have no problems with year long spritual practices. Both lived the extreme, but in the most noble way. The book inspired me in my own spiritual practice and was a great reading.